A new study from the University of Colorado indicates the Manhattan-sized asteroid that crashed into Mexico in the dinosaur days had a different outcome. It could have triggered a global firestorm that would have burned every twig, bush and tree on Earth and led to the extinction of 80 percent of all Earth’s species. The collision would have vaporized huge amounts of rock that were then blown high above Earth’s atmosphere, as the team – led by Douglas Robertson of the Cooperative Institute for Research in Environmental Sciences (CIRES) showed using models. The re-entering ejected material would have heated the upper atmosphere enough to glow red for several hours at roughly 2,700 degrees Fahrenheit — about the temperature of an oven broiler element — killing every living thing not sheltered underground or underwater. 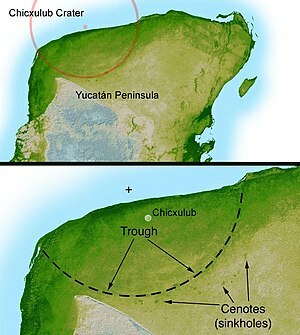 According to geological evidence, the asteroid collided with Earth about 66 million years ago and carved the Chicxulub crater in Mexico’s Yucatan Peninsula that is more than 110 miles in diameter. As the ejected material re-entered Earth’s atmosphere, it dumped enough heat in the upper atmosphere to trigger an infrared “heat pulse” so hot it caused the sky to glow red for several hours, even though part of the radiation was blocked from Earth by the falling material, he said. But there was enough infrared radiation from the upper atmosphere that reached Earth’s surface to create searing conditions that likely ignited tinder, including dead leaves and pine needles. If a person was on Earth back then, it would have been like sitting in a broiler oven for two or three hours, said Robertson.